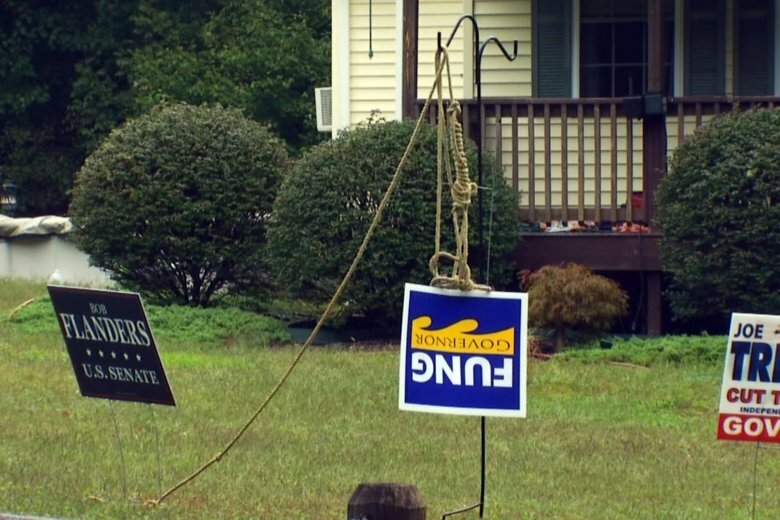 PROVIDENCE, R.I. (AP) — After harsh criticism, a Rhode Island homeowner on Tuesday removed a campaign sign for the state’s Republican gubernatorial nominee that was hanging upside down from a noose in his yard. “Think about the message that this is sending to many of the kids in that neighborhood,” Fung said. Fung, who would become the state’s first Asian-American governor if he wins, is challenging Democratic Gov. Gina Raimondo in November. Joe Trillo, who chaired President Donald Trump’s 2016 campaign in Rhode Island, is running as an independent. WPRO-AM posted a photo Tuesday on Twitter of the upside-down sign, which Izzo brought to Fung’s campaign headquarters late Tuesday afternoon after removing it from his yard. Fung wasn’t there at the time.